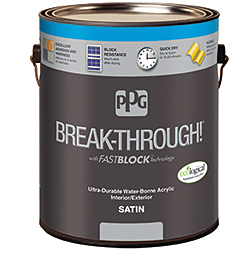 BREAK-THROUGH paint is a water-borne acrylic that is formulated to bond to common substrates as well as fiberglass, laminate and other plastics. Low-VOC, low odor. Dry to touch time of 15 to 20 minutes, according to the company. Durability and hardness are comparable to conventional alkyds.